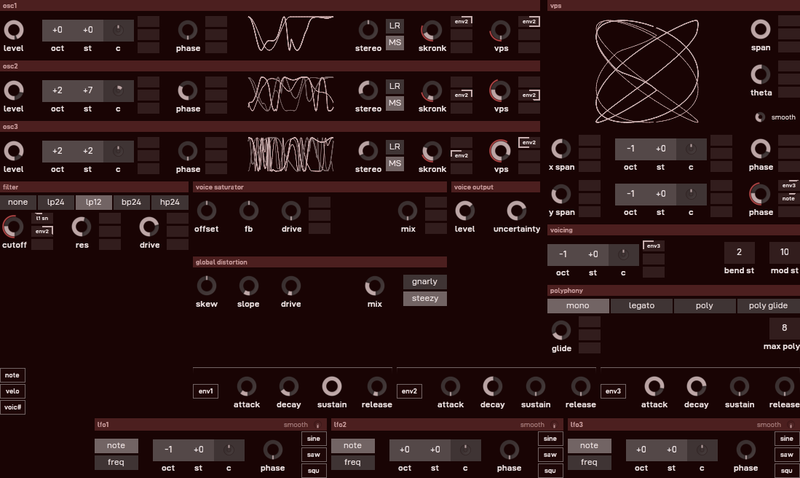 Cadmium is a vector phase-shaping synthesizer. Vector phase-shaping (VPS) is an evolution of phase distortion, taken further in Cadmium with audio-rate modulation. This opens up a sound palette characterised by moving, morphing, shifting timbres – from snarling jungle bass to classic FM tones and everything inbetween. It has the accoutrements of a subtractive synth: a modelled filter, envelopes and LFOs for modulation, but with a fresh approach where it counts – the oscillators. 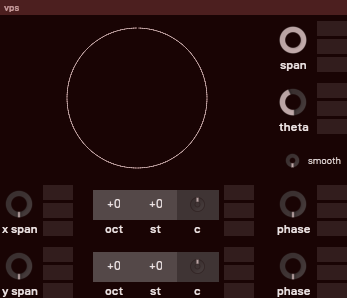 Cadmium is now available as a VST2 plugin for Windows, MacOS, and Linux. AudioUnit and LV2 plugin formats are in development and coming soon. Explore new timbres with two-dimensional VPS modulation. With an audio-rate oscillator per axis, you can go beyond traditional phase distortion tones – turn the shaping parameters up and detune the oscillators for ruthless, snarling basslines, or mellow out with shifting, morphing pads and drones. Cadmium has three carrier oscillators, all in stereo for extreme width effects. Each oscillator has independent VPS modulation amount and pseudo-wavefolding parameters, in addition to the standard transpose and variable phase controls. Temper your tone with the multimode filter. It's a loosely-modelled 4 pole transistor ladder lowpass, with pole mixing for additional responses. Smooth your sound out with that classic buttery ladder sound or turn the drive up to add an extra edge. All presets except pad have been slightly altered to make for a better mix. Bass: WRL Drown Bass for mid+high with slight Fruity Convolver, clean BASICS Sines for sub. Melody: KL Ring (+ duplicate for octave) and WRL Float Keys with Fruity Reverb 2. Pad: ERC Ensemble Pad with Fruity Convolver. Arp: ERC Wurlitzer with Fruity Reverb 2 and Fruity Delay 3. Progressive trance demo from b.trx. Floaty sequence with automation on filter cutoff and LFO1 octave. 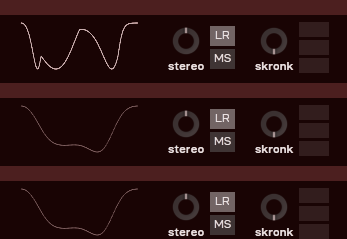 Post FX: EQ (to thin out the mids), Teufelsberg Reverb, Bus Compressor (to smooth out the levels). One note, no automation, no post effects. Cadmium 1.0 is now available for Windows, MacOS, and Linux. A license for Cadmium 1.0 is valid for all releases until 2.0. Cadmium licenses are either per-user or per-seat. That is, a licensed copy may be used by one person on multiple computers or on one computer by multiple people. Despite these stipulations, there is no in-plugin license check or authorisation, and, as such, Cadmium releases are DRM-free. The demo can only load sounds from the factory bank. When loading a sound from another source (for example, saved inside a project), the UI will display a reminder of the demo capabilities and Cadmium won't make any sound. The demo does save patches in project files which can then be loaded by the full version. The demo has no "copy/paste patch" functionality. The demo will occasionally display a nag screen when opening the UI. Requires a GPU supporting OpenGL 3.2. Requires MacOS 10.7 or newer. Depends on xcb, xcb-xkb, xcb-icccm, xcb-cursor, xkbfile, and xkbcommon. The Cadmium manual is available to read online. For all support, bug reports, and feature requests, please send an email to support@lhiaudio.com. If you'd just like to get in touch, drop a line to hello@lhiaudio.com. Low-volume tweets about product releases and updates. Personal account. Higher volume, more jokes, more profanity. Better discourse for a better future.